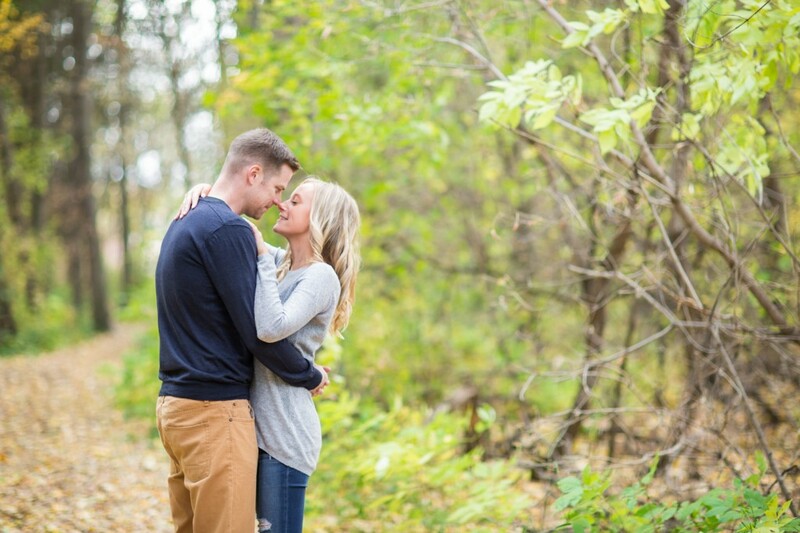 Paige and Ian wanted their engagement session to take place close to home. 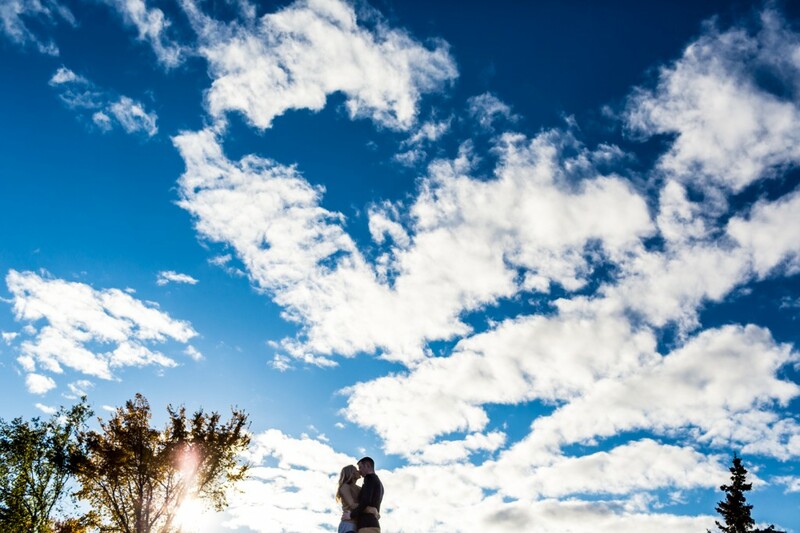 It was a beautiful fall day when we headed up to St. Albert for their autumn engagement photos. 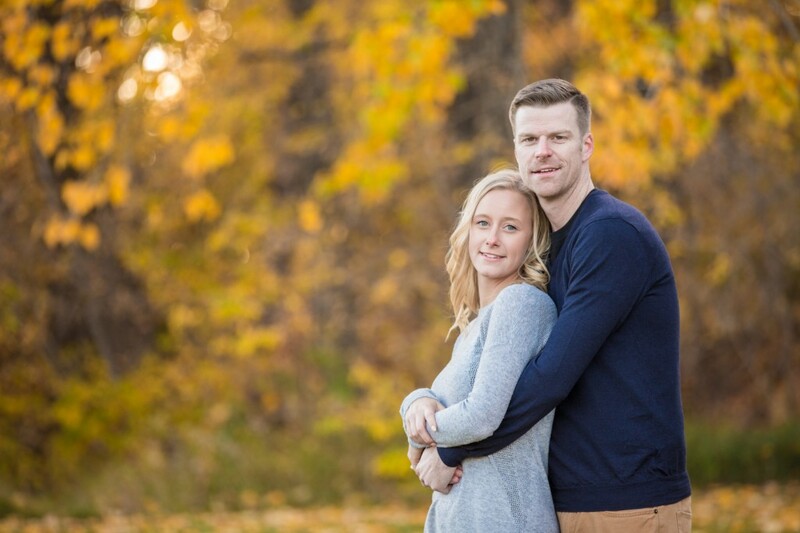 It was a perfectly cool September evening when we met up with Paige and Ian in the heart of downtown St. Albert. After a short walk around the library, we found ourselves in the beautiful Lions Park. We were graced with gorgeous sunset light and beautiful green and gold leaves. As we strolled though the leaves and took full advantage of the perfect fall evening we captured some very sweet and romantic engagement photos. 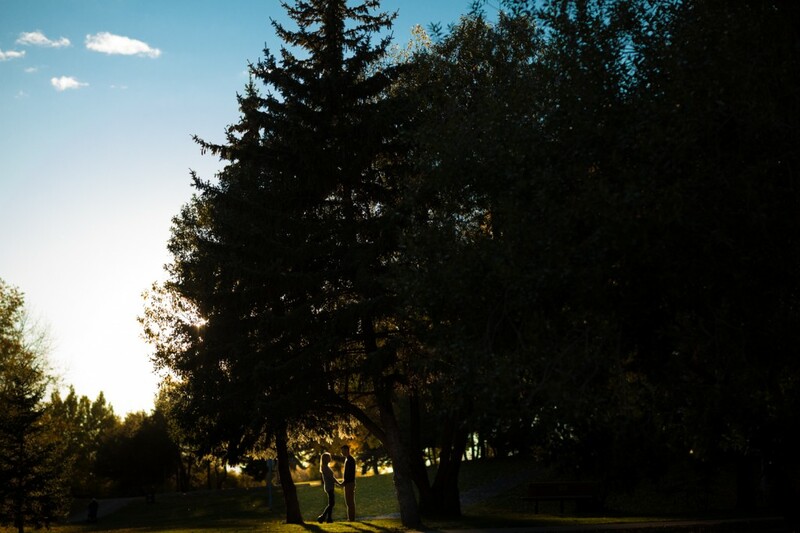 Lions Park is a gorgeous green space in the heart of downtown St. Albert. 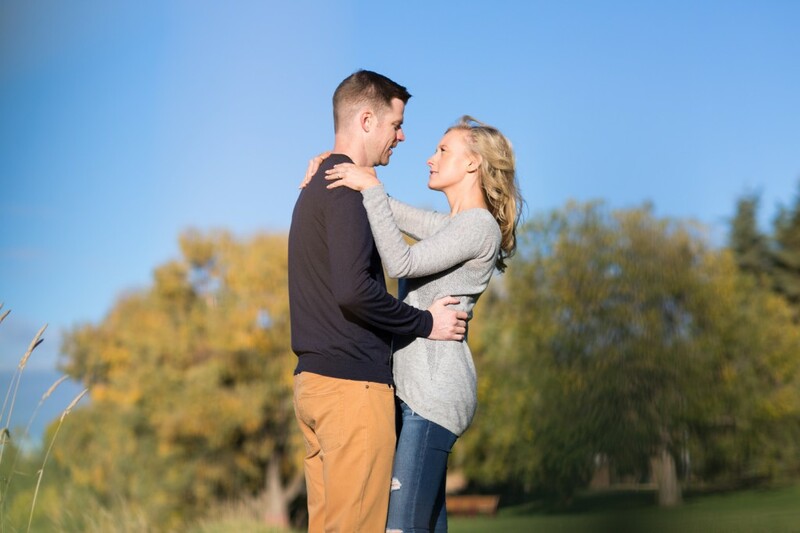 The mix of paved walking trails, groomed landscaping and rugged tree-lined pathways made it the perfect location for engagement photos. With a few trees already dropping their leaves, the pathways were covered with bright orange and yellow leaves. 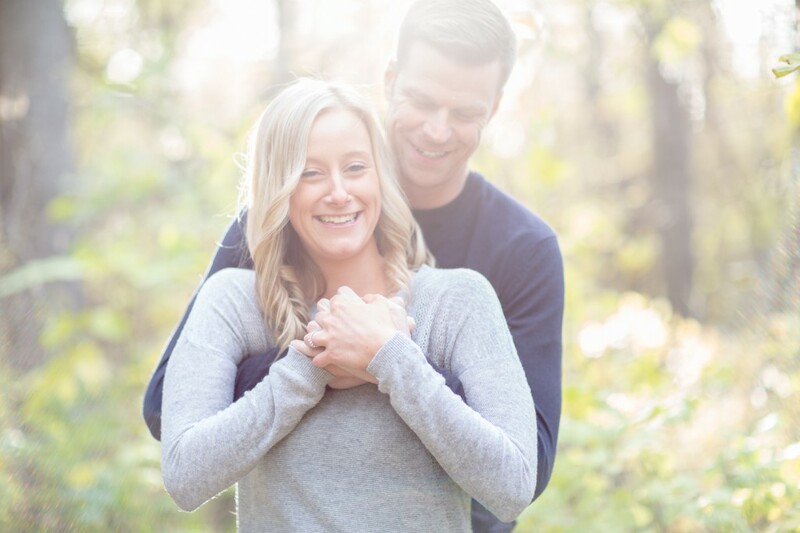 Paige and Ian kept their look stylish but casual as they wanted to be cozy and comfortable for their session. We love the matching neutral tones of their outfits which fit perfectly with the autumn landscape. You don’t have to be wearing matching velvet track suits to look in sync with each other! Our clients often tell us their engagement session is the first time they have had professional photos taken. We always suggest they read our guide on preparing for engagement photos. 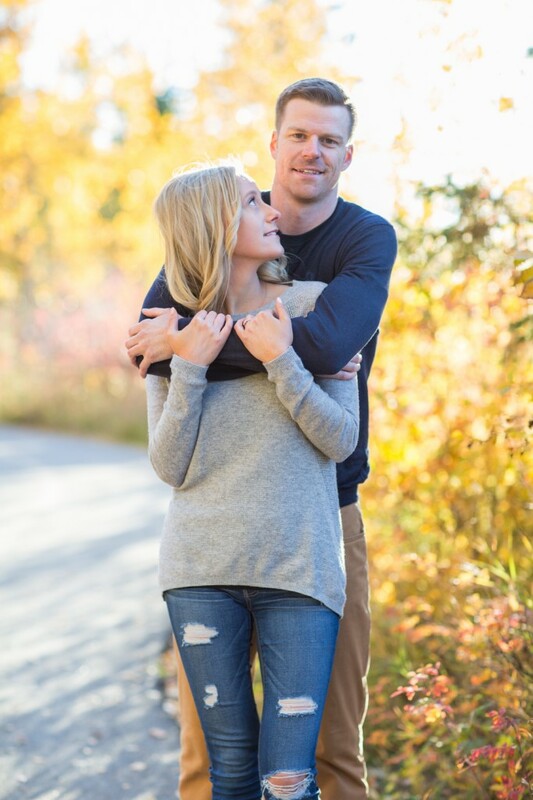 We are very excited to be joining Paige and Ian in Mexico for their destination wedding in December! Paige and Ian were married in a beautiful and intimate wedding ceremony at the Azul Fives Resort in Mexico. Their family and friends joined them for a week of sun, sand and ceremony as these two newlyweds tied the knot. You can check out Paige and Ian’s Azul Fives wedding here!